What does the term "Emergent Church Movement" mean? Caryl Matrisciana: It is a difficult word. How do you define Emerging? "It hasn't come yet. We don't know what it could turn into or where it is going." Because it is emerging, it's a very, very clever label for a movement that in actuality is going to be emerging into the one-world religion that is going to usher in the Antichrist. That is what it is emerging to. It is emerging to new truths. It is emerging into a new Christ. It is emerging into the new concept that you don't need to really understand truth. Dr. Reagan: Basically, isn't the Emergent Church saying that Christianity needs to be reconstructed? 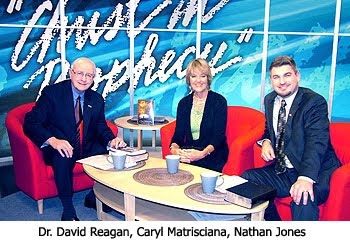 Caryl Matrisciana: They believe the Bible should be reformed, reinvented, and redesigned. Nathan Jones: In other words, just throw the Bible out? Caryl Matrisciana: It sounds good initially because in actuality they want to try to reach out to the Post-Modern culture. They claim that traditional Bible believing Christians don't do that well anymore. Well, if you actually look at the back of that concept, they're saying that God didn't know that we were going to be a Post-Modern generation right now. God didn't anticipate that men were going to become such wretched sinners and so God gave up. Nathan Jones: Really? And, they found that out, how? Out of their own heads then? Caryl Matrisciana: If you think it through logically, that's what they're really claiming. They're saying that God didn't design the Bible to converse and attract today's generation. What's really happening is that today's generation is instead pulling away from God's truth which is the same yesterday, today and forever. The Word of God is what we've got to come back to. We've got to realize that we are sinners. We've got to come back to the center. Caryl Matrisciana: Another concept that we've got to realize is behind the Emergent Church is that within Eastern Mysticism and Hinduism is its basis on the idea of Evolution. There are two opposing worldviews: one is that God created the Creation, and other one is that the world evolved. These Eastern religions believe there is evolving truth and so there is evolving religiosity. Truth is evolving and there is where the Emergent Church comes to be based on the foundation of Evolution. Dr. Reagan: It seems to me like that the Emergent Church Movement simply does not understand the power of the Word of God. They feel like that we have to change the Gospel and present it in a whole different way in order to relate to the modern generation. But, the Gospel is supernatural in its power. Just as you were converted just like that, this can happen to a person in the Post-Modern generation as well if they are confronted with their sin. Caryl Matrisciana: If they are confronted with the Word. See, I was given the power of God unto salvation. The Gospel is the power of God unto salvation. If I hadn't been given the Gospel I couldn't have gotten saved. The Gospel says that I am a sinner in need of a Savior. That's what was given to me in those few minutes that opened my eyes. It's the power of the Word that opens the eyes of the spiritually blind. Satan knows the Word of God has true power. Satan came to Eve in Genesis 3 and questioned, "Surely, God hasn't said?" He immediately attacked the authority of the Word, so it's no different a tactic within the Emergent Church than what Satan's been using all this time since the Garden of Eden. In the next part of this interview with Caryl Matrisciana on the Emergent Church, we'll learn why they are so caught up in environmentalism. The Emergent Church are not dummies. They know exactly what they are doing. And it is nothing new. People have tailor made their religions to the taste of the masses for a long time. Whether it is Hitler's religion of Nazism, Manson's religion of drugs and orgies, Camping's religion of end times date setting, Occupy Wallstreet's religion of protest, Obama's religion of socialism, etc. There's a lot of people out there just waiting for someone to spoon feed them their very own religious concoctions. And there's a lot of people out there dishing out those concoctions that will get out of it what they crave be it money, power, fame, etc. All of these cults and apostate movements have their origin in the lack of personal discipline and responsibility of individuals to read the scriptures for themselves. The cult persona is even found in the camp of Bible prophecy students who deify scholars and accept every interpretation provided as fact. A perfect example of this, is the belief that the European Union (E.U.) is a fulfillment of prophecy concerning a revived Roman Empire. When one examines the truth of scripture we see that the 10 toes/horns represent regional powers that will emcompass the globe. They will possess independent political and economic realities. It is reasonable to conclude that the reasoning behind the globe being divided into 10 seperate regional powers is that finally people realize that diversity ensures sustainability. When the world comes together in the form of united economic blocs and political institutions the danger is obviously the domino effect. While the European Union is failing and will ultimately collapse, the domino effect will ensnare the United States and Asia, bringing the entire global economy to collapse. The collapse of Europe even has effected the Pope, no doubt he is worried about his personal investment portfolio as well as state welfare programs that keep Vatican City from collapsing under the weight of its own indebtedness. The Pontiffs recent call for a united global monetary structure or entity would only ensure more intability and economic chaos. The Emergent Church Movement is not unlike the financial and political world, all seek a universal appeal. The (E.C.M.) seeks to bring in all the religions of the world under one umbrella. The nations of the world and their political and economic leadership seek to unite the citizens of the globe in trade, monetary policy, religion, and political leadership. While they spread the mortar to build their modern Tower of Babel it will ultimately lead to further chaos and instability. The Ten Kings that will arise in the aftermath of the coming global economic collapse will for a time be secure and prosperous be divided into distinct regional powers, yet even they will succumb to a new Nimrod (AntiChrist) that will seek again to unite the globe as one under the banner of Babylon. Rodney, while I agree with you that a more likely scenario concerning the 10 Toes is not a division of the EU but of the world, it is just a scenario. Since we can't know what that division will look like, I see no reason for you to take your usual shot across the bow at thinking, Bible believing students. Frankly, I'm rather tired of you calling us all stupid, Man. If you re-read Scripture, the ten toes/horns are 10 KINGS (check the Greek)that come out of the head of the 4th Beast, the iron ROME. They may become regions or kingdoms under A/c? BUT the actual wording emphasises 10 rulers/kings and not kingdoms. Of course I could be wrong as I found this all on my own without a scholar guiding me! The 4th Beast of Iron is DIVERSE to the previous three beasts. It is this ability to be diverse that will bring in the Roman prince. Unified yet diverse! Diversity in Unity! And that is the motto on the proposed world coinage. Nathan, it is not a shot across the bow, it is clear that every kingdom mentioned in Daniel covered the known world, the 10 toes/horns which is 10 Kings with their perspective kingdoms is no exception. No one was calling anyone stupid by the way, I am sure you can agree that many follow interpretations that are clearly errors taught by their perspective scholars. Joel Richardson and Walid Shoebat are just a drop in the basket! Some error laden interpretations are more subtle then others. We are all human, errors can be expected by any of us, that is why we must individually and earnestly examine the scriptures being led by the Holy Spirit, not just rely on interpretations by reknown or respected scholars. No one can deny that even today eschatological interpretations of certain Protestants during the Reformation period, sought to identify Rome and the Roman Catholic Church as fulfillment of several prophetic passages in relation to Great Harlot of Babylon, Commercial Babylon, False Prophet, and a number other prescribed prophetic passages. The demonization of the Roman Catholic Church was effective yet perverted the true identity regarding these prophetic passages. These errors still survive today. If the Emergent Church is the False Church that will become the Harlot, then obviously the list of candidates continues to grow. That is precisely what I am saying, every movement or group that comes along is suddenly being cast as the "New Star" and the process begins again to identify them as the fulfillment of specific prophecy that once was labelled as Rome and her pagan Church. Obviously something is not right! Rodney said "it is clear that every kingdom mentioned in Daniel covered the known world, the 10 toes/horns which is 10 Kings with their perspective kingdoms is no exception." The Roman Empire covered the KNOWN world...so I would think that a revived Roman Empire would likely cover the same area, not necessary the entire world. Also the EU has adopted the imagery of the harlot on the beast, the Tower of Babel, etc. I agree with the concept of a new Roman Empire, likely an evolved form of the current EU, headed by the antichrist. After all, doesn't a foe from the east threaten the European based antichrist at the end of the tribulation? If the whole world is the antichrist's then exactly where in the world would the "east" be? East of California? East of Iceland? East of Hong Kong? NO! It has to been East of the old Roman Empire since the antichrist's forces meet the foe from the east in the valley of armageddon (spelling?). Billy, it is the AntiChrist that overthrows 3 of the Kings and their perspective kingdoms, prior to the remaining 7 relinquishing their kingdoms or regions under the control of the AntiChrist. The ascension of the AntiChrist as King of Babylon will be one of conquest solidifying his powerbase. It should not be a difficult task for the AntiChrist, after all he will as I believe first secure a global disarmament pact in exchange for promises of prosperity, ensuring that he alone will have military dominance. It seems to me that Scriptures referring to the political anti-christ are being confused with those that are referring to the spiritual false prophet. The facts are that the Harlot is here NOW! The reformation thought that the Pope was THE a/c. Although the R.C. church is linked with politics because Vatican city is a State; she is more particularly, the spiritual whore of Babylon whose ruler is *A* false prophet. The spiritual harlot is even now, riding the political beast. It isn’t that the Harlot church WILL come; the fact is she is here NOW! Today, 27/10/2011, the Pope, who is *A* false Prophet, presides over a meeting in Vatican city attended by over 200 ‘christian’ denominations along with representatives of most world religions, if not all world religions? The only thing that is not yet known; is the actual name of the a/c; or the actual name of THE f/p (for certain). This will not be known until the revealing of the name of the a/c is publically revealed and kicks off the 7 yr Trib. The present leader of this Emergent Harlot church is Pope Benedict. Another Pope (the so called representative of christ on earth, the ‘vicar of christ’) may well be voted in to replace him, and he (a Pope) will be the name of the f/p, who will set up the image of the beast in the Temple and instruct the world to worship the image of the Beast. This will be in the midst of the week. Traditionally, I believe the final Pope is expected to be called Peter! I repeat; the Harlot church, through ecumenism, is here NOW, helping to set the stage for the coming a/c.